I spent my weekend at my desk, still inspired & creating away. I am a happy woman! Just wait till you see what I've made for you. 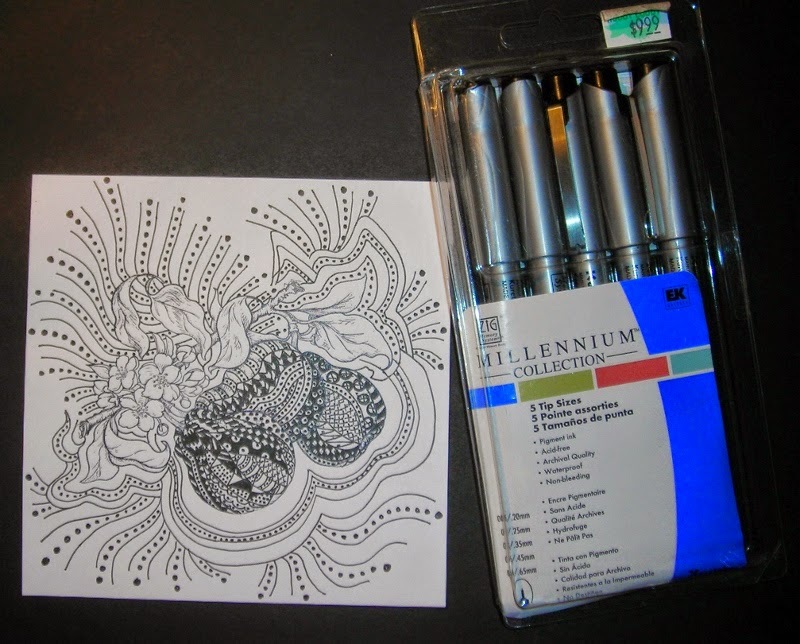 This is another technique that is really popular right now---"Zentangle!" "What?" You say, "With Flourishes Images?" 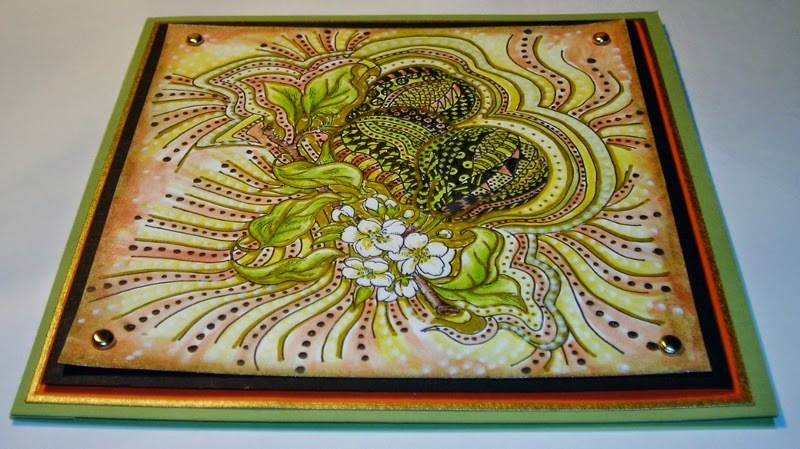 I did Zentangle for the design idea...I like all that doodling! 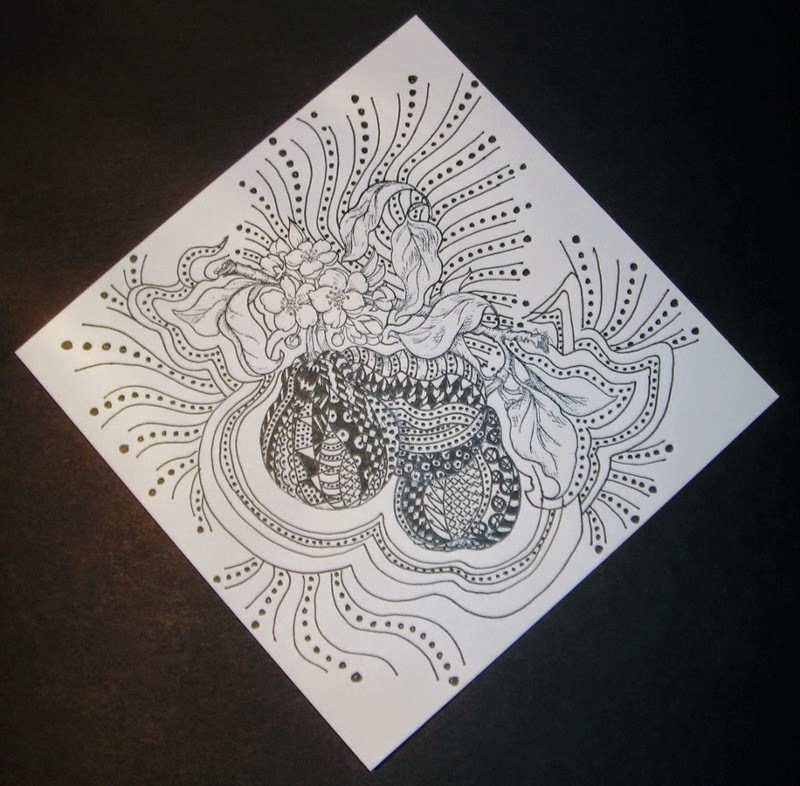 When doing Zentangle, it is a repetition of patterns & doodles. What I did reminds me of Indian Embroidery or Elizabethan or Jacobean Embroidery. I am quite pleased with how it came out. What I did actually changes the whole image into something totally different! Because it changes the image so much, you can turn your image in most any direction! As long as it is pleasing to your eyes! There are books out there to help you with patterns & would you believe, each pattern has a name? 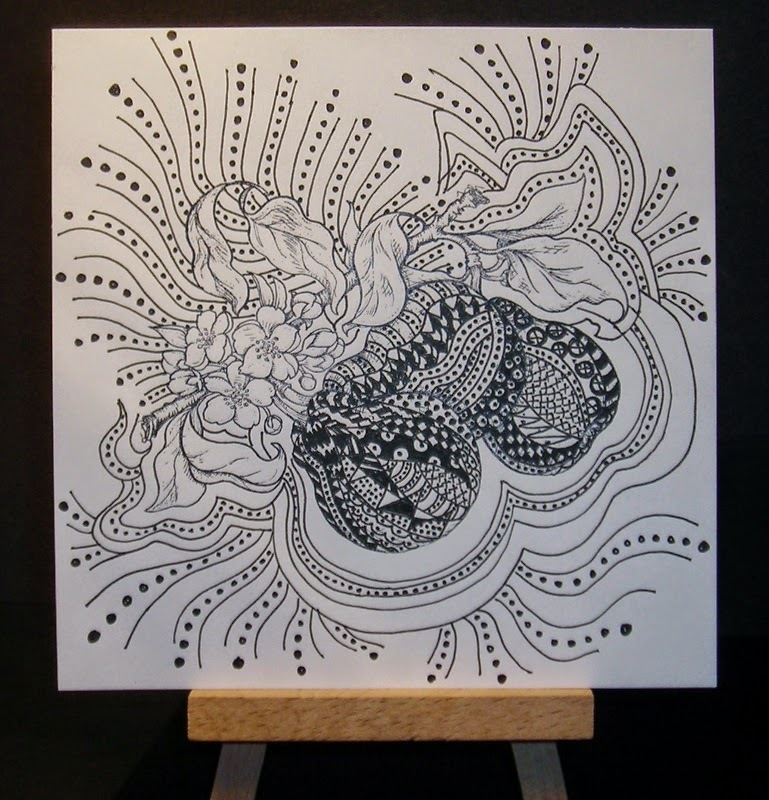 Just Google "Zentangle" & you'll get a wealth of information & video's too. Let me show you what I started with. First of all, I used Flourishes- Pears. Then I did a repetition of doodles & patterns. This is before I colored it in. & I left parts untouched of any pattern. These are the pens I used to do my doodling. EK-Success Millennium Collection, there are all different sized tips for you. You can find them at Hobby Lobby & I've seen them at Michaels' too. (Do be careful when water coloring with these. Now, take a peak at this image colored in! I used Letraset Aqua Water Color Markers on regular card stock. 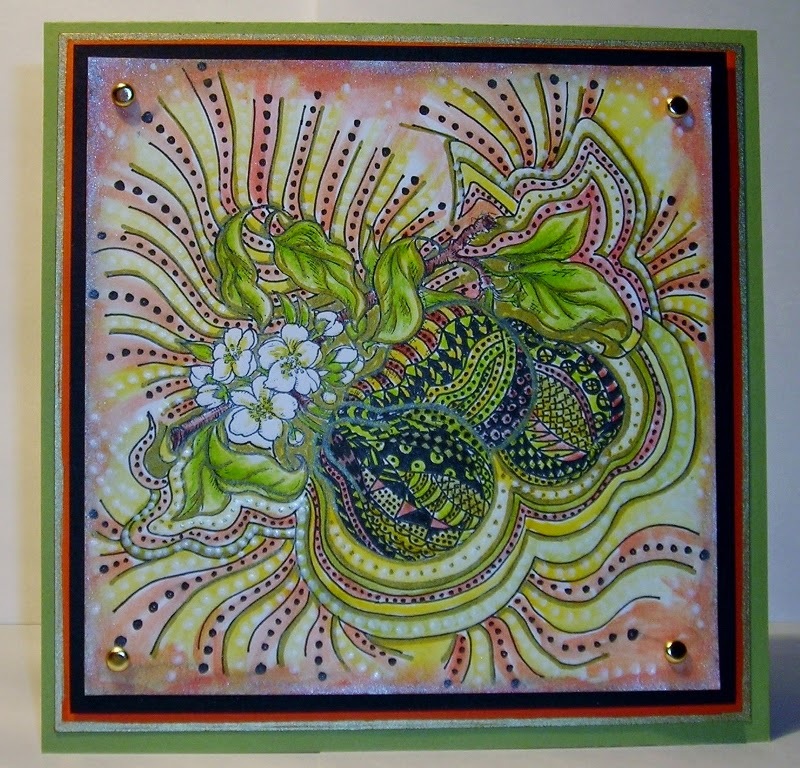 I created a palette on my acrylic block & then used my Letraset Blender Pen to pick up the color. & Faber-Castell- Pitt Artist Pen-White 101***. The more I worked on this piece the more I got into it. And I kept pulling out this & that to make it even more "Artsy." 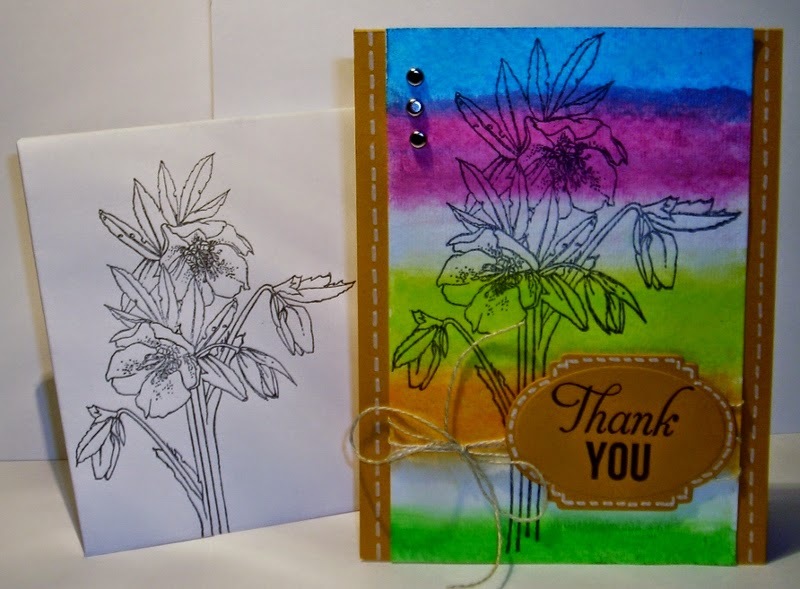 There is just something so freeing about getting "artsy" with your supplies. 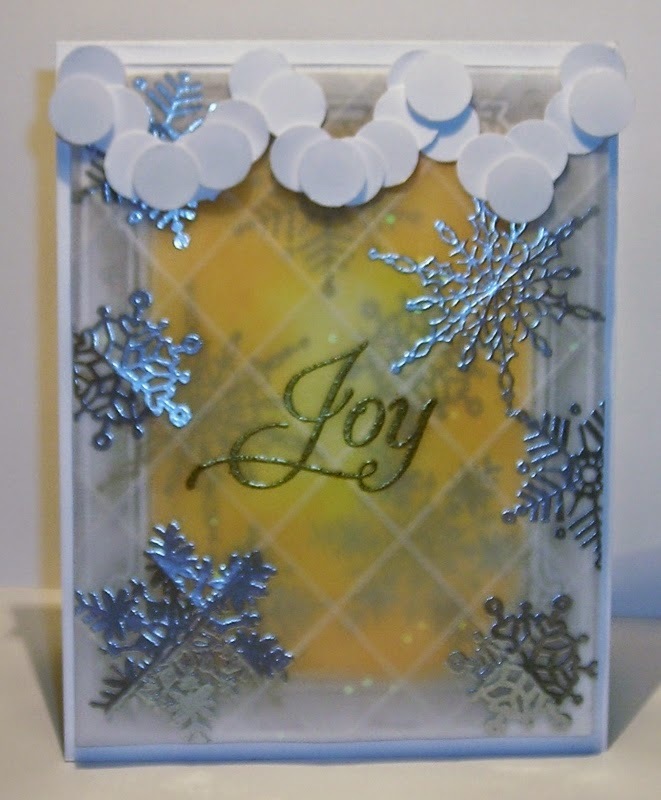 & I used my Gold Gelatos on the edges of the image! Gold on your project just makes it elegant. & then I popped the black card stock with my image, up on dimensionals. No ribbon or do-dads with this one, I wanted the image to be the main focus. & there is nothing better than to have it be from a friend. 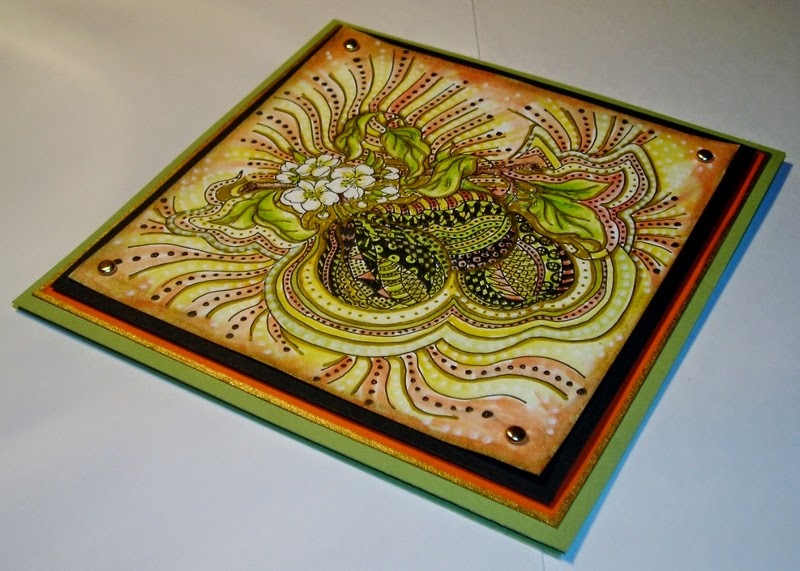 You could make Wall Art with Zentangle. It would be the talk of all who enter your home. Do it on a Canvas. 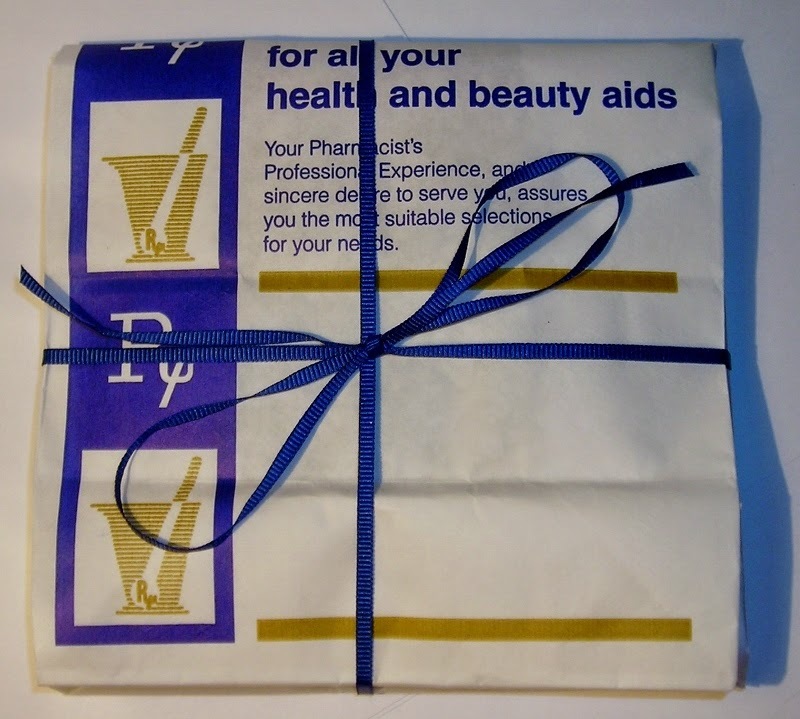 When sending a Get Well Card &/or Gift, use one of your used pharmacy bags for wrapping! 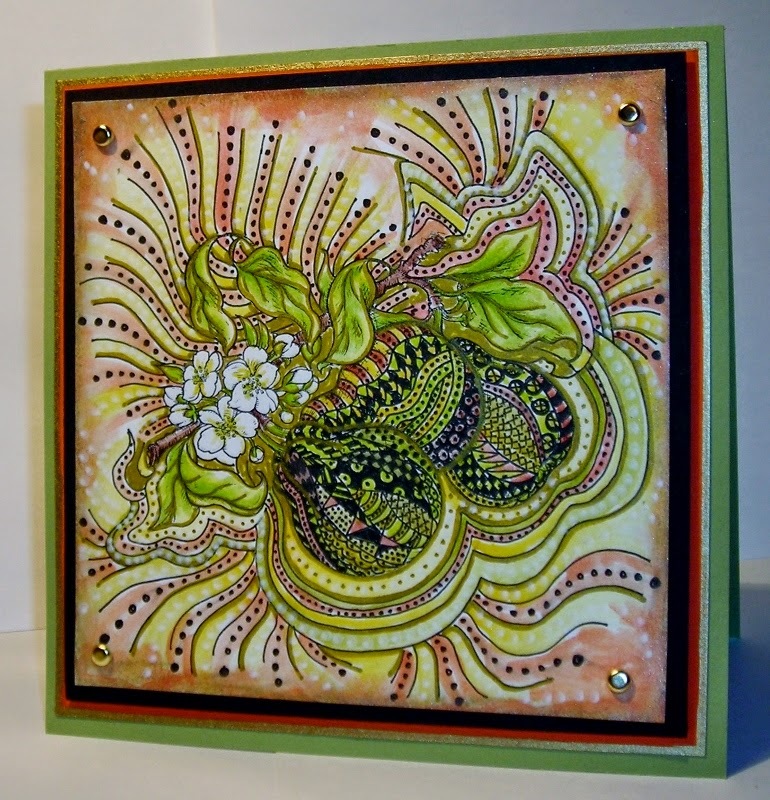 Here I have my Zentangle Card & a special CD for my friend! I think Praise Music does the job for when one is ill or going through something! The Bible says to, "Offer up a sacrifice of praise!" "By Him therefore let us offer a sacrifice of praise to God continually, that is, the fruit of our lips giving thanks to His name." Basically, this tells us even in times of trouble when our hearts are breaking & streams of tears running down our faces, we must trust God, giving Him thanks even in those difficult times. And not just thanking Him IN those times, but thanking Him FOR those difficult times! It is difficult to do, I know. then He can accomplish whatever goal He has in mind, in OUR HEARTS & MINDS! Because our time here on earth is to make us LIKE HIM! It is a matter of trusting Him! I have found there is no better music than Praise Music! If your bag is a little wrinkled from being used, just run your iron over it. 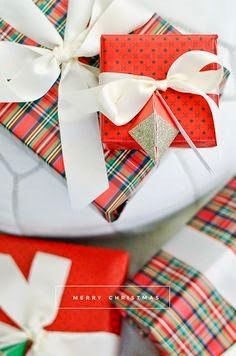 Place your card &/or gift inside & neatly fold the bag over & wrap a nice ribbon around it! 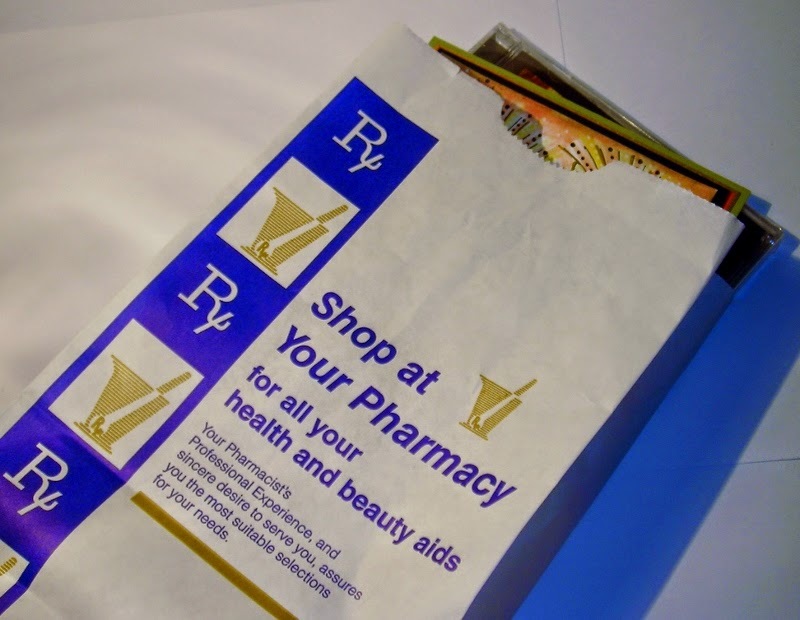 The perfect "Prescription" for someone special needing a lift! ("What CD is it?" You might ask, it's Phillips, Craig & Dean- Let Your Glory Fall. 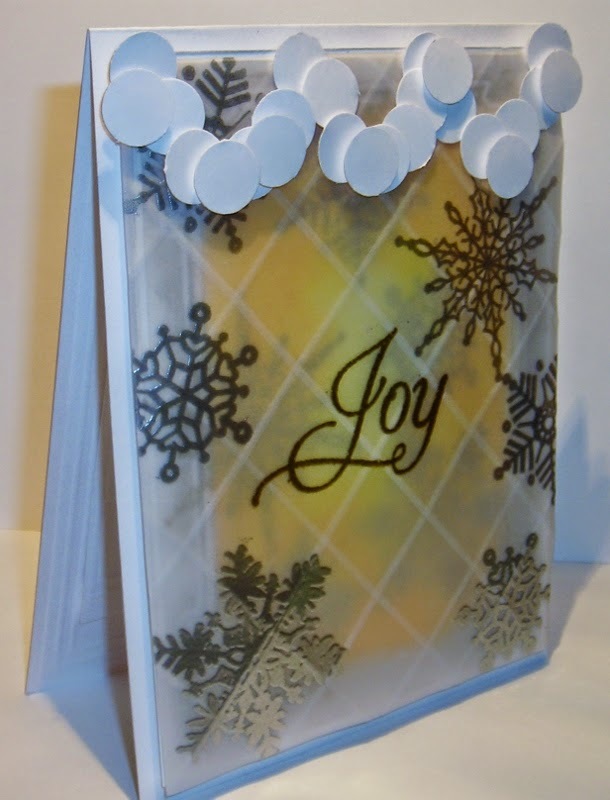 I hope you decide to try this fun technique & get artsy with your supplies. & I will be playing with some new goodies! Inspiration that WON'T go away! I know you thought I wouldn't post anything more this week, BUT I JUST HAD TO! & I thought you'd like to see it TODAY, in-particular! I've seen this "technique" done on the web several times over as of late, but when my daughter received a gift from my "DEAREST, BESTEST FRIEND" in the WHOLE-WIDE WORLD, I just couldn't help myself but use her gift for inspiration! 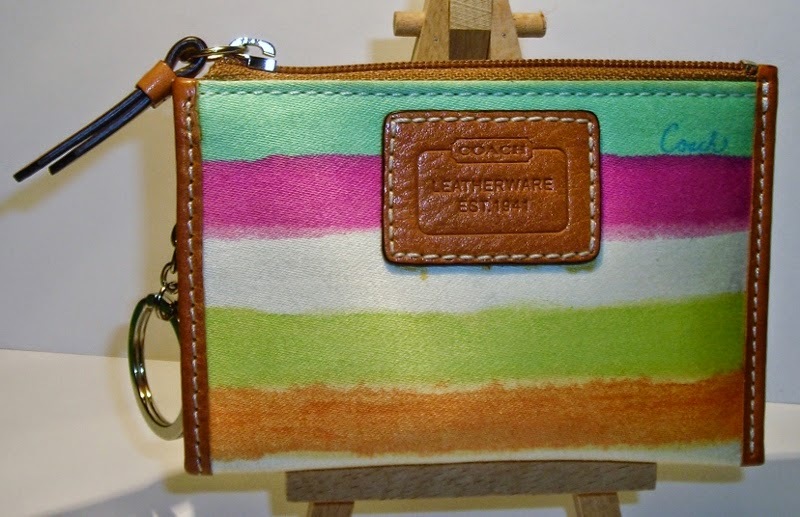 I had taken our daughter out to find a wallet with a change purse built-in, but we could only find large wallets. Just not our daughters style! My friend didn't even know! This little coin purse will do the trick & it's soooo pretty too! Our daughter is quite pleased with her gift. 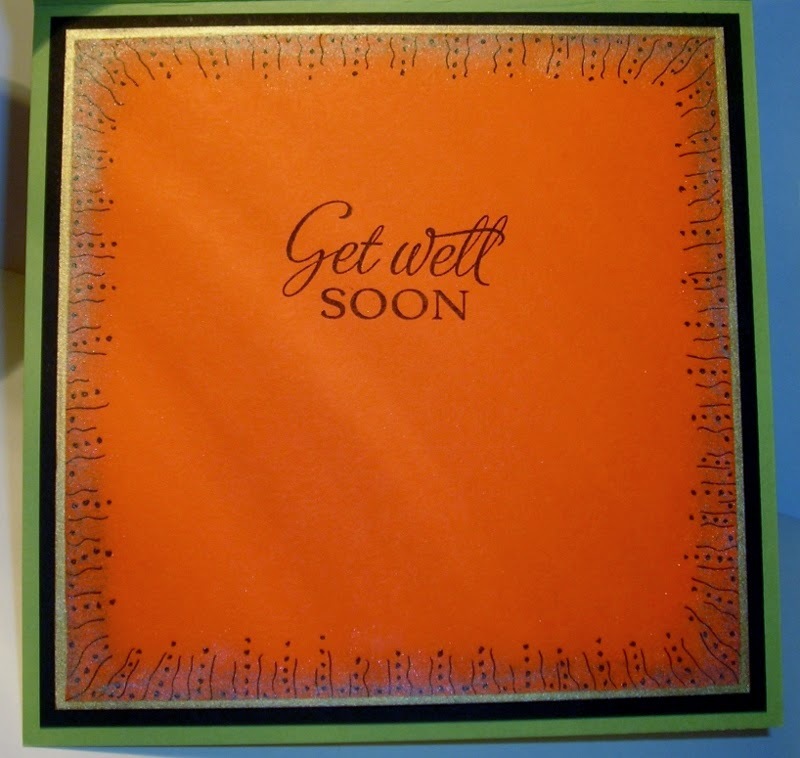 So, of course, we must send a Thank You Card! I paired them up so you could see how they match, such inspiration! 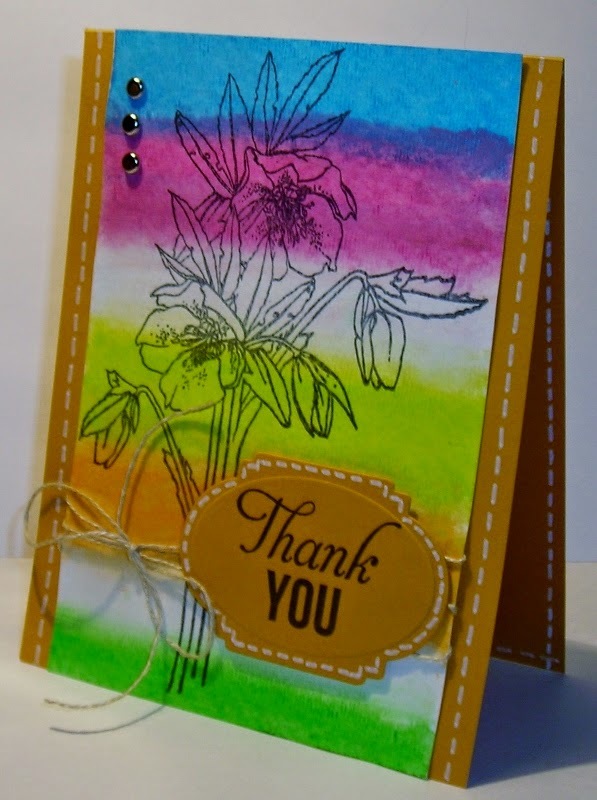 I used Flourishes- Always Blooming, a Sam Pickard Design & Sentimental Favorites! 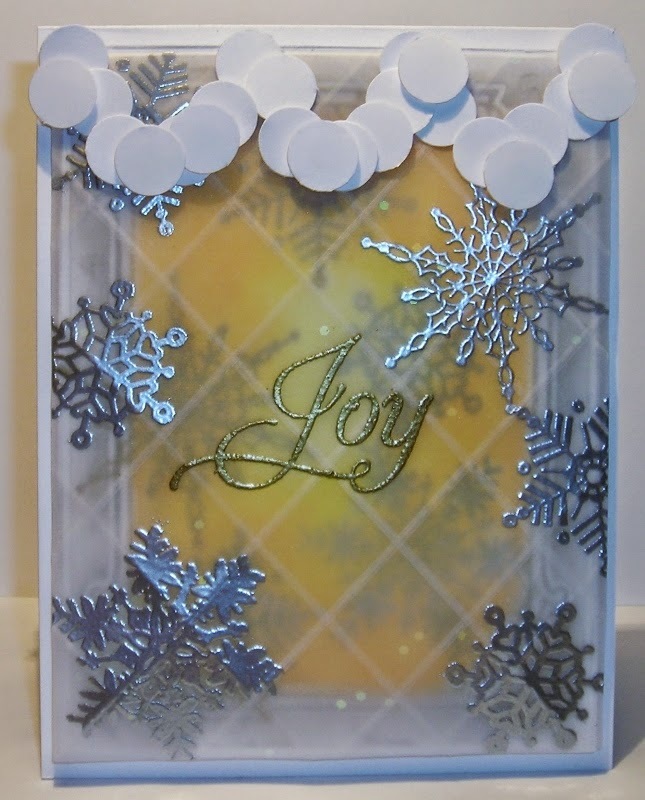 Along with Flourishes- Classic Frames Template Dies. 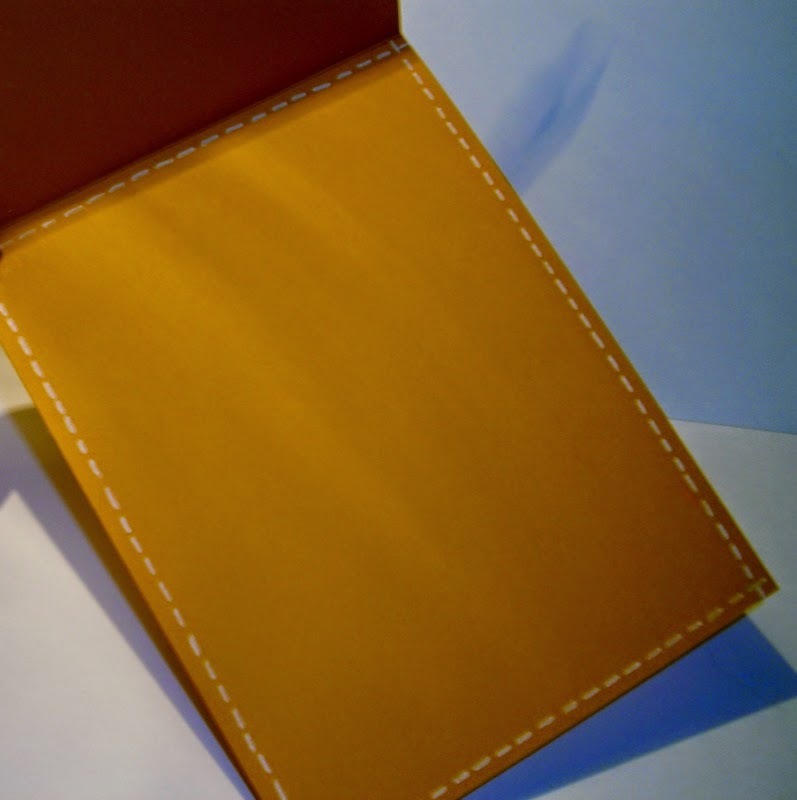 The inside is quite simple, giving you lots of space to write a proper "Thank You" note! 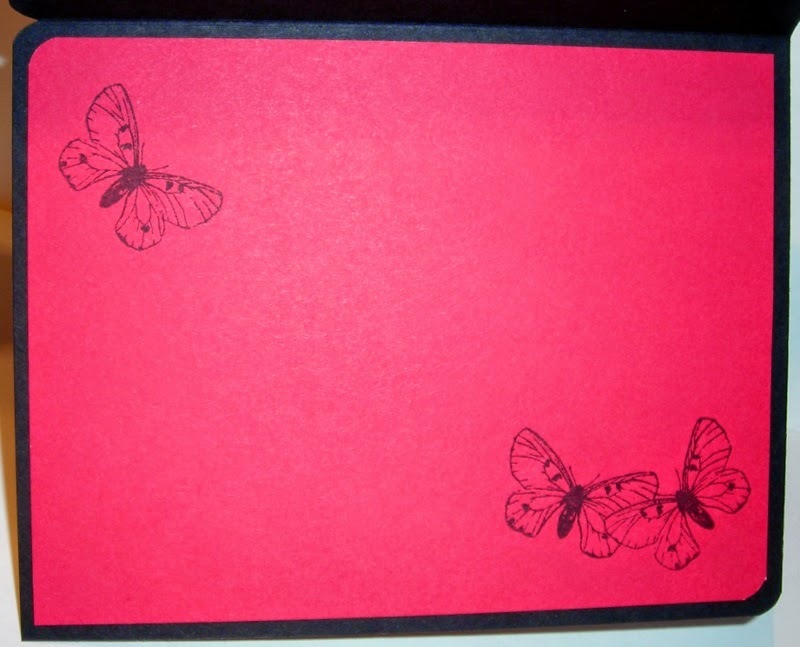 Don't forget to make a matching envelope! 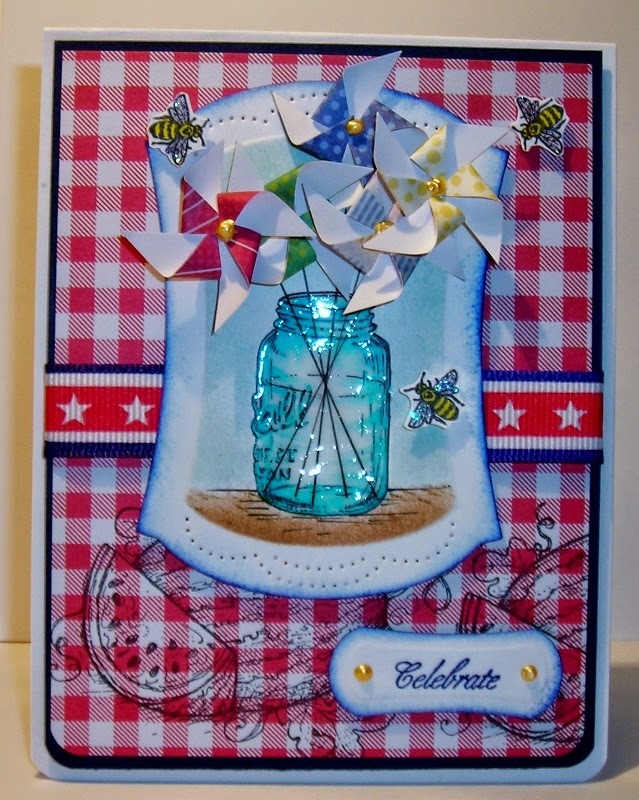 Below I will give you the Gelatos & supplies I used to make this card. It's quite simple to make, & it has a big impact! If you have any questions, just ask away! I am QUITE INSPIRED TODAY! 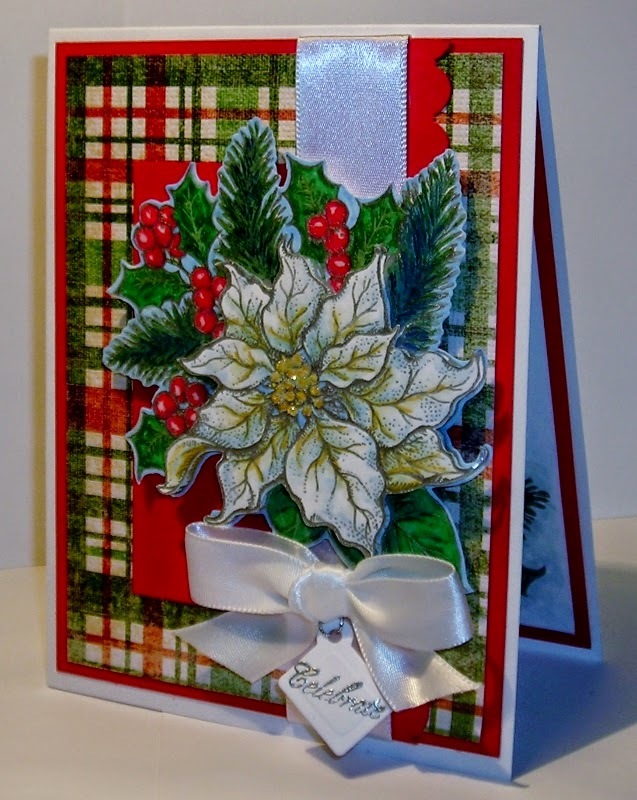 A Flourishes "Christmas in July"--Part 2! First of all, I want to say "Thank You" publicly to all my followers & those that left me a note of encouragement last week! You are appreciated more than you know! Some of you sent me personal e-mails too--encouragement just for my eyes! God is good & He used YOU to bless me last week! "Thank You!" I think I have the best followers! 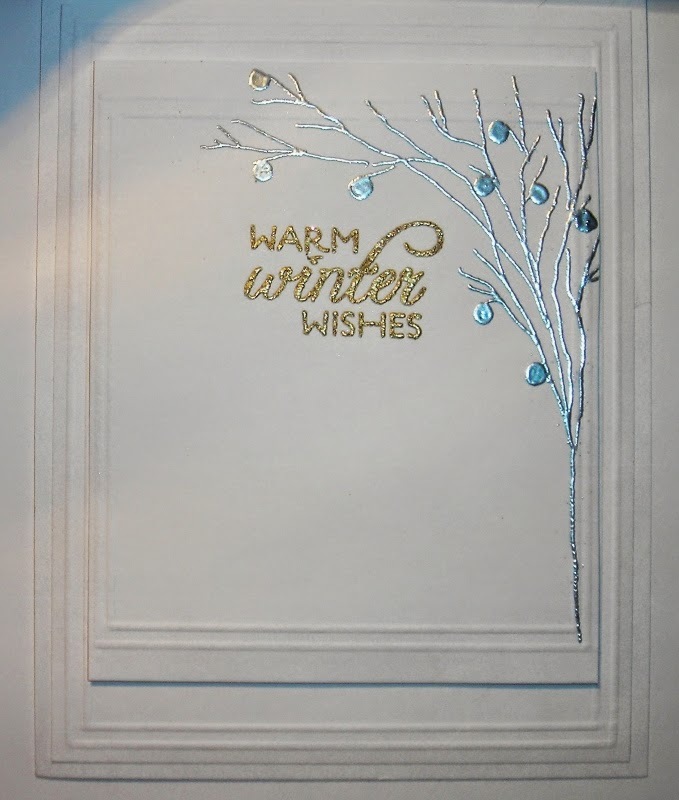 As I contemplated what to post this week, I couldn't let the opportunity to use some of my gorgeous Flourishes Christmas Stamps go unused! 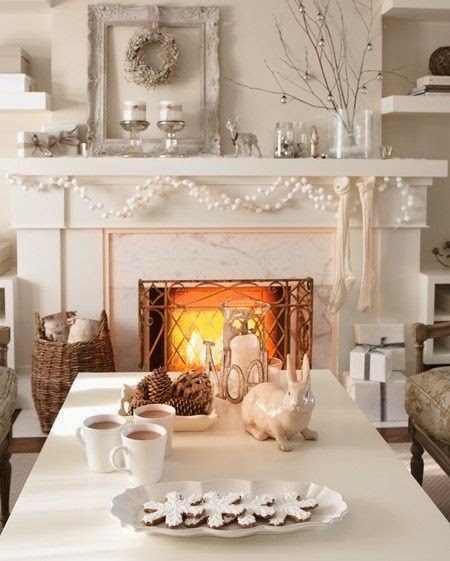 I love the white on white & the warm glow of the fire, the lines of the fireplace, the marble, the snow flake cookies in the forefront, the white garland, the silver & the gold..... Sigh! Who would have thought it could make one so happy? (Of course, anytime of the year you think about Our Saviors birth, is a time that fills my heart! He came as a little babe, to die upon a cross for our sins, that was His purpose. 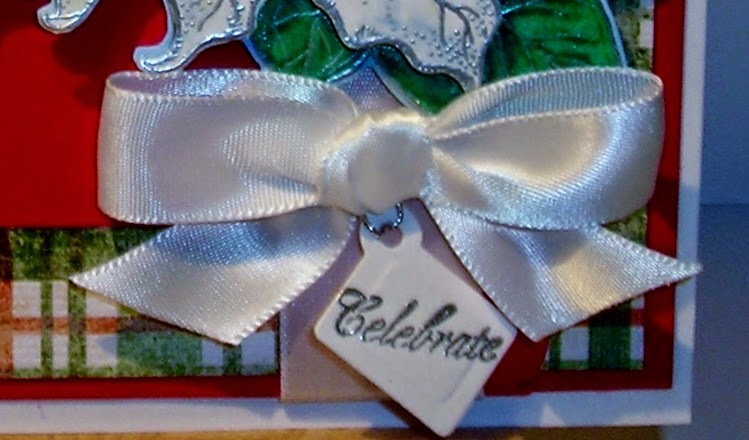 Yes, it is a time to celebrate with all you have! To me, gold & silver are always appropriate for this blessed day. That little babe IS a KING! It's never too early to get those Christmas cards done! 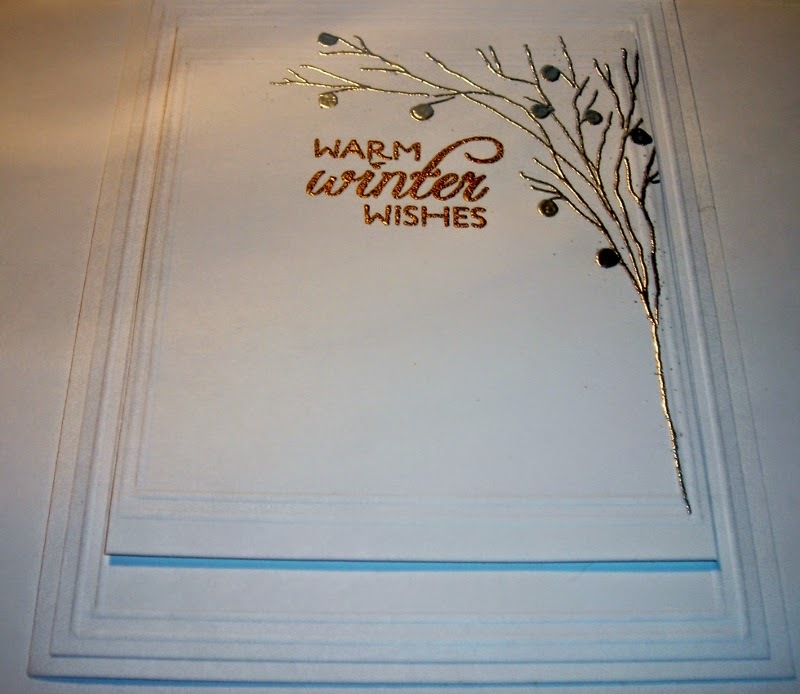 I used Flourishes- Handmade Snowflakes. 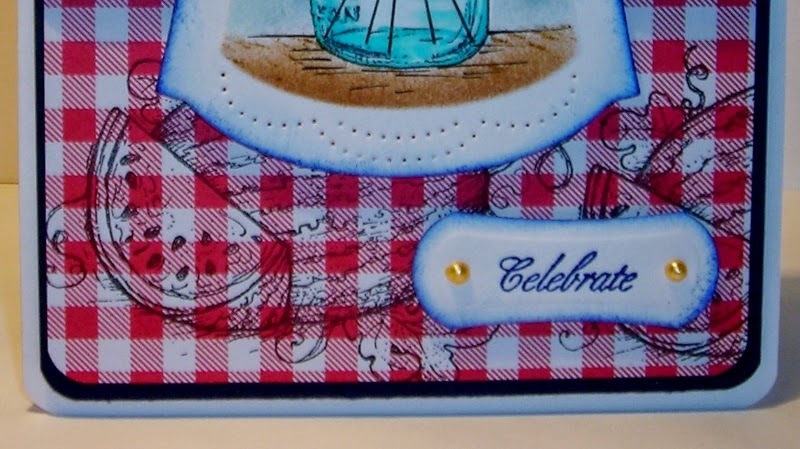 Notice the scoring across the front piece of Iridescent vellum? This is to mimic the grate on the fireplace. I just used my Score-Buddy & a McGill Stylus- 3mm. I used a Cuttle bug folder- Grace's Frame, to make the frame & then I used Gelatos to get the marble gray from the picture, using the color Squid. Just applying & rubbing it with my finger. I wanted it to show up just a little through the vellum. 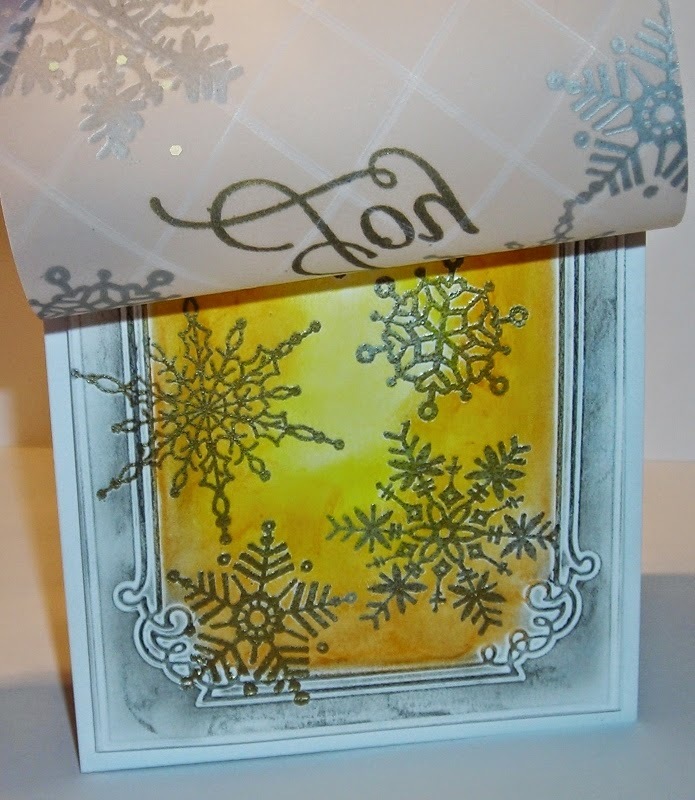 a combination of two embossing powders--silver & gold. Then using my Gelatos again, I colored the center with Butter cream, then Lemon & then Mango on the outer edge, to give the warm glow of the fire, just blending them with my finger. 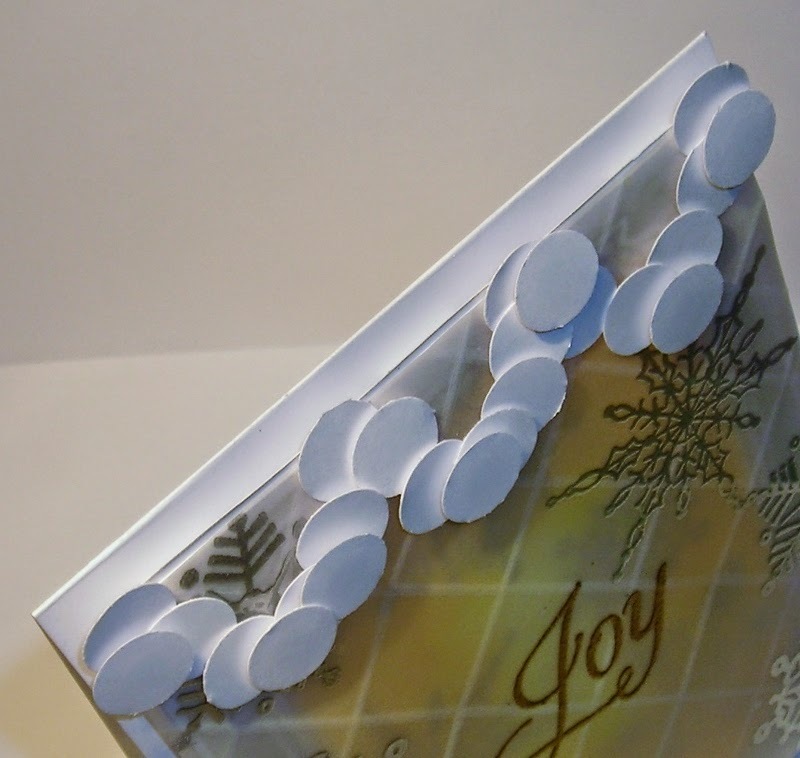 I topped off the card with 1/2" circles for the white balls of garland on the mantel. 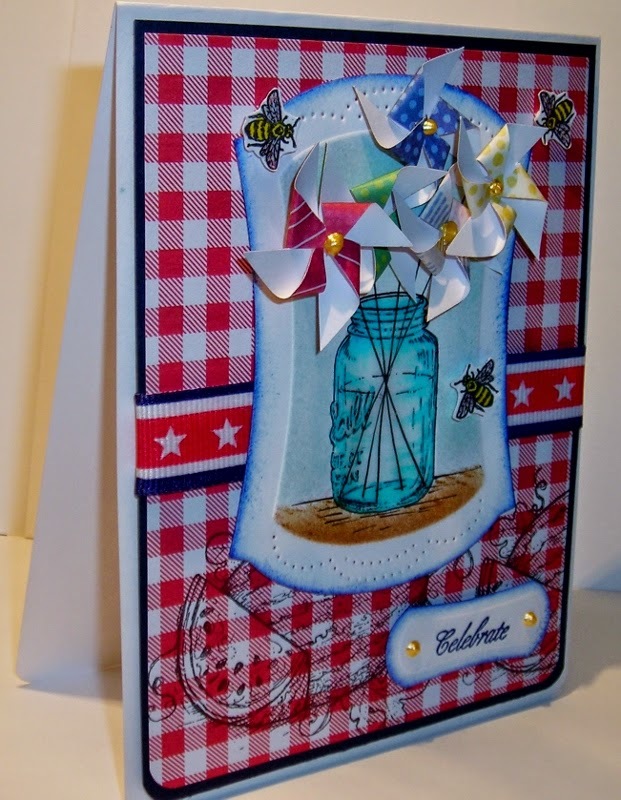 I used glue dots to attach them & some have dimensionals behind them to make them pop- up! just like when you photograph a fire-- the"bokeh" effect! Iridescent Vellum just works for this! 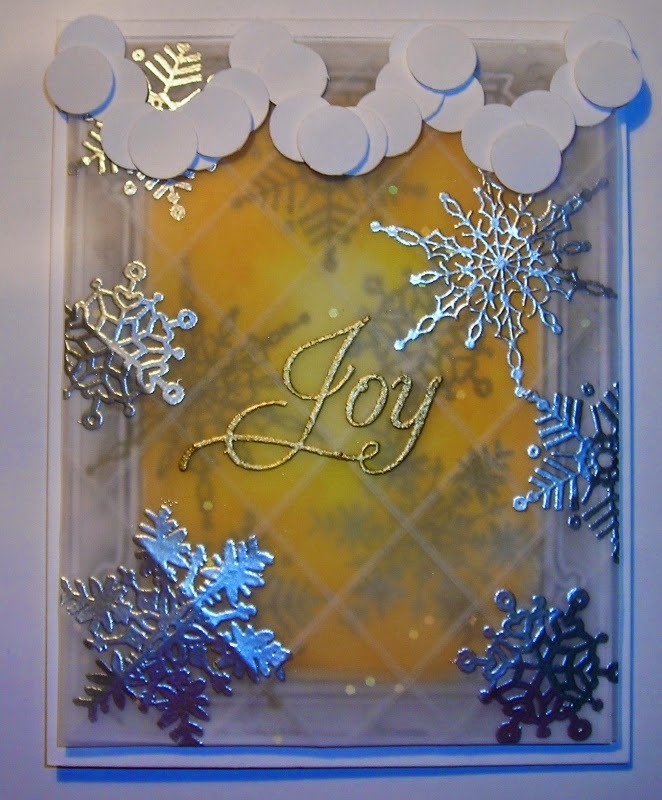 sprinkling it with silver embossing powder & heat embossing it. should be done in a warm gold. 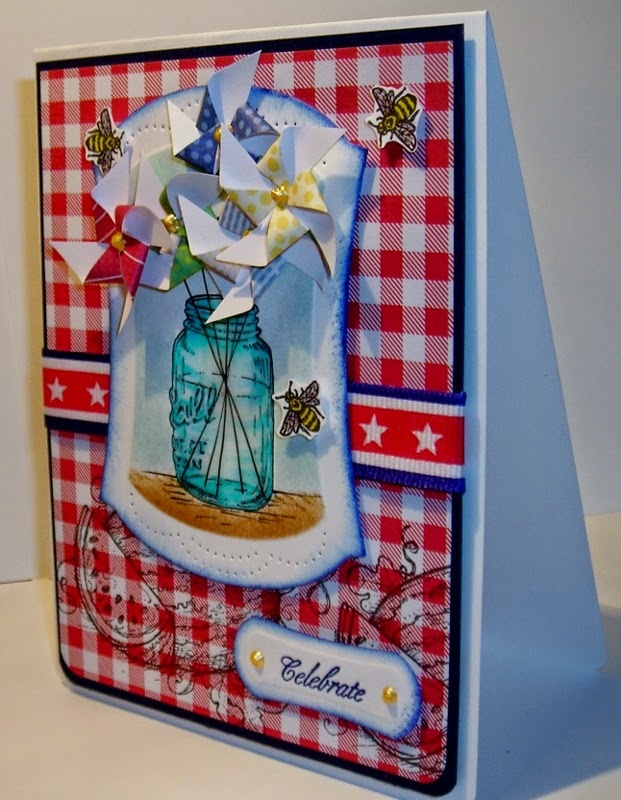 I've enjoyed making this card. It's just a tad different from what I "normally" make, but it was fun! 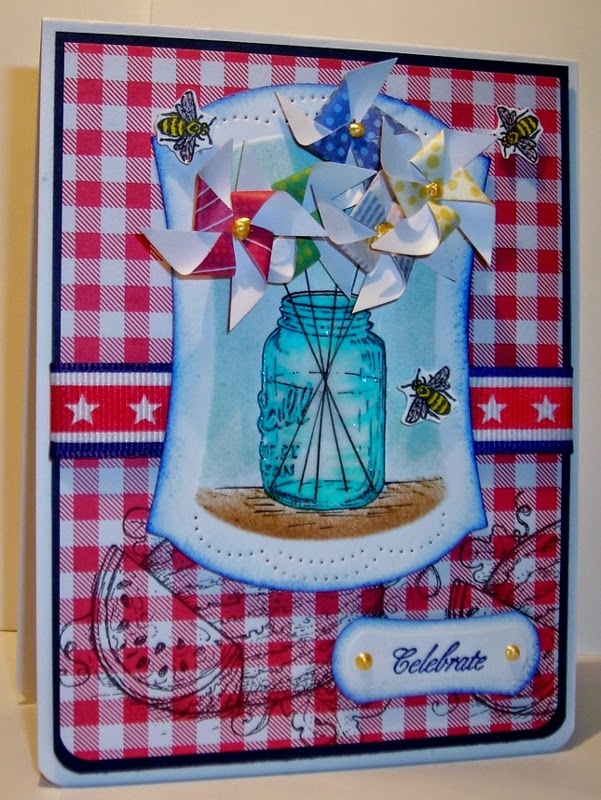 I think when you start getting "artsy" when making a card, it's just pure fun! 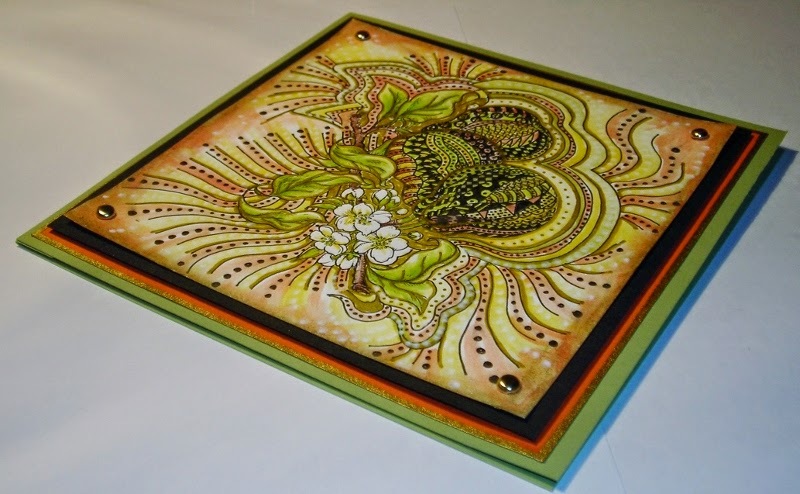 Stepping out of your comfort zone & coming up with something that makes your heart sing! I'm happiest when I am creating, like many of you, or singing praises to my Lord! Do try something a "tad different" from what you normally do & just see! Today I want to "speak life" to you! I know that if there are trials in my life, there must be some in yours. The trial that seems to keep popping- up, is the same I shared with you once before--- there are people that don't want me to help Jan Marie with Flourishes; for whatever their reasons...! We have not forgotten anyone. If I am sent an e-mail with questions that I feel should be answered by Jan Marie, I send them on to her. I will not answer questions about "inside information,"
however innocent the question(s) is/are. Flourishes is Jan Marie's business, not mine. I'm not "in-charge." Nor should you assume I am. As a DT Member, I am to follow Jan Marie's lead, & that is what I am trying to do. I am on this team for the time that God has allowed. I know that each one of us, in whatever we do, can be replaced. It's when we think we can't be replaced, that that is the time for us to go! Like I've said, I am working to help Jan Marie. "Why are these people continuing to try to shut Jan Marie down?" "Why can't Jan Marie have someone to help her?" "Why can't Jan Marie have her company back?" "Why can't Jan Marie have her blog back?" "Why do they have to destroy her?" "What are these people afraid of?" & "How is this behavior 'godly'?" Maybe, my questions will answer some of your questions or maybe, my questions will make you have more questions? We all have our issues that we need to work on, we all need forgiveness, compassion & understanding. "Make allowance for each others faults, & forgive anyone who offends you, remember the Lord forgave you, so you must forgive others." There are many things I cannot boast about, my talent, how many followers I have etc...... The only thing I can boast about is Christ! He asks us to "speak life" to each other. I've been told I, "hide behind my religion." It is true that I'm not perfect. If I were, I'd be in heaven now. A much better place! I have a lot of growing in Christ yet to do. It is true that I lean on Christ! He is my Savior, my Lord & my God! That's what He wants from me! Actually, He wants that from all of us, that call ourselves His. It is very easy to get distracted in this life. I want to speak as He would speak. That is how "Christians" are to speak if we are truly His! I choose to please Him, rather than man. Because that is what He asks of me, to be like Him! I know scripture tells us to be different than the world. "And so brothers & sisters, I plead with you to give your bodies to God because of all He has done for you. Let them be a living & holy sacrifice---the kind He will find acceptable. This is truly the way to worship Him. Don't copy the behavior & customs of this world, but let God transform you into a new person by changing the way you think. Then you will learn to know God's will for you, which is good & pleasing & perfect." This tells me we are to behave/react differently. (If we don't live according to The Word of God, we are not a "Christian." Living by the Word of God produces fruit--the Fruit of the Spirit is defined in the Bible as: love, joy, peace, long suffering, gentleness, goodness, faith, meekness, & temperance--Galatians 5:22. The Bible is the Christians Guide Book to living the Christ-like life! A standard that never changes! It isn't easy! I think it would be easier to lash out. Sometimes, I think that is exactly what these people want me to do! I don't believe Christians are "door mats" as I've told you before. then you must follow scripture & sometimes use the laws of ones country when necessary. that isn't against the law, nor is it "abuse!" I also want everyone to know that Jan Marie is a person that I am gaining much respect for! She makes me think of my Jr. High Art Teacher that had a great impact on my life. Jan Marie is my teacher when it comes to Flourishes! kindness & believing in my ability! We all need someone in our lives like this! My husband is another person who speaks life to me with all of his love & support! & all of our secret sins! He understands our frailty where sin is concerned. That is why God had compassion on us & sent His Son to die for us! I can say, I will bow before my Lord & He will say, "Well done, my good & faithful servant!" That is why I speak the way I do about my faith, because it is what life is all about! JESUS IS THE ESSENCE OF LIFE ITSELF! Now, let me "speak life" to you! (I am speaking to anyone listening! Maybe, this is the very reason Christ has allowed this trial, so I will do this post with His message of hope! You can know you are ready if you have asked Jesus to be your personal Savior! "If you confess with your mouth that Jesus is Lord & believe in your heart that God raised Him from the dead, you will be saved. For it is by believing in your heart that you are made right with God, & it is by confessing with your mouth that you are saved." " For everyone who calls on the name of the Lord will be saved." If you fault me for being bold about my faith, then I am guilty! If you fault me for telling the truth about what I believe, then I am guilty! If you fault me for "hiding in Jesus," then I am guilty! (There is no better place to hide! If you fault me for believing Jesus loves you too, then I am guilty! If you fault me for wanting you to know Jesus, then I am guilty! If you fault me for being sold out for Christ, then I am guilty! but each color symbolizes something! 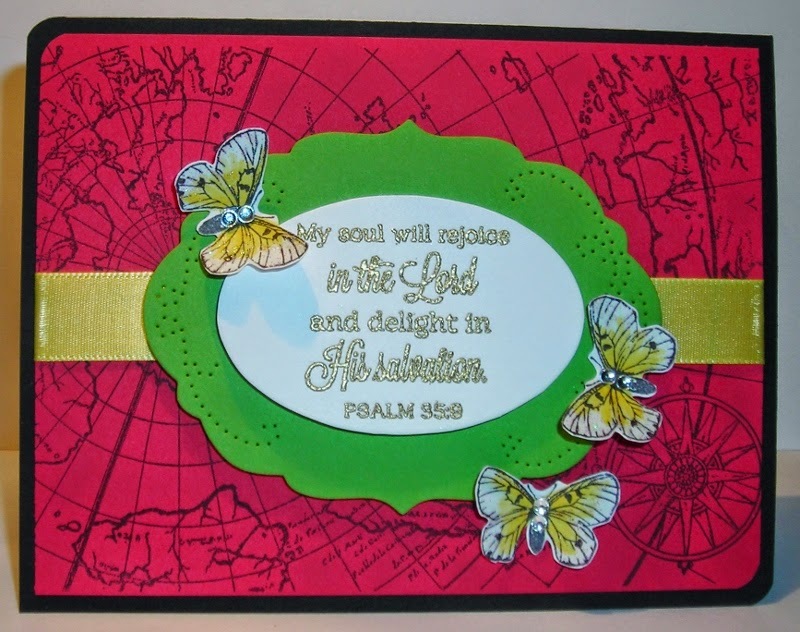 I used Flourishes- Background stamp- Antique map, symbolizing the world. The black on this card symbolizes the sin of the world. The red symbolizes the Blood of Christ that covers the sins of each person in our world, who asks Christ's forgiveness for their sins. Matthew 1:18-21; Luke 1:26-38; 2:1-20; 24:1-12; John 18:28----19:30, 38-42. Then our hearts will be as white as snow the Bible tells us, without spot or blemish. Luke 24:13-46; John 20:24-29; 1 Cor. 15-6-7. 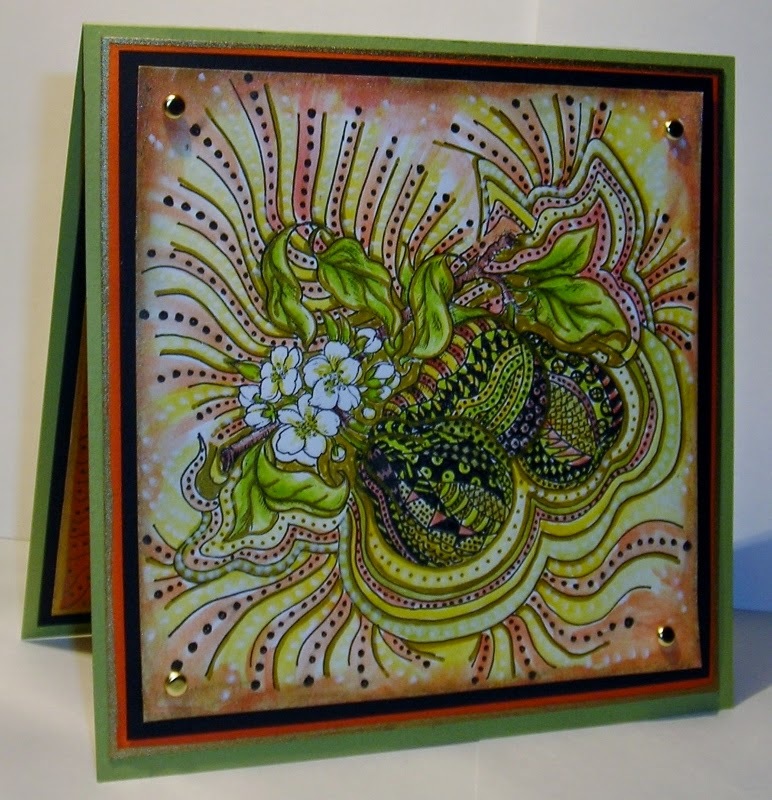 I used Flourishes- Victorian Oval Template Die. so that we can stand before God holy! We need to study the Bible for ourselves, so others won't lead us astray from God's Word. The Bible says that there are many out there that twist God's Word & lead many astray! You want to know God's Word for yourself! 1 Tim.2:1-2; 3:15; 4:13-16; 2 Tim. 1:1-5; 2:15, 21-22; 3:14-17; 4:2, 5, 7-8; Acts 16-1-5. 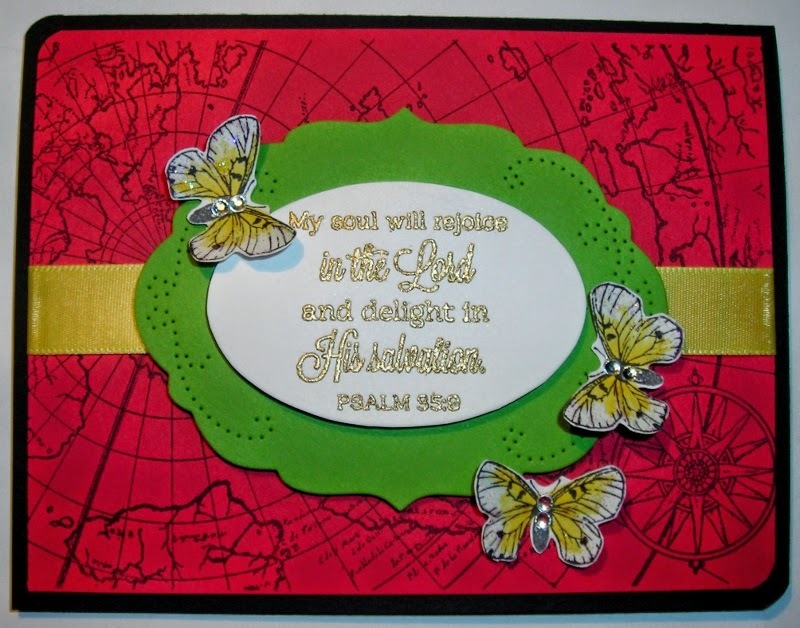 The scripture verse is from Flourishes- Easter Wishes. 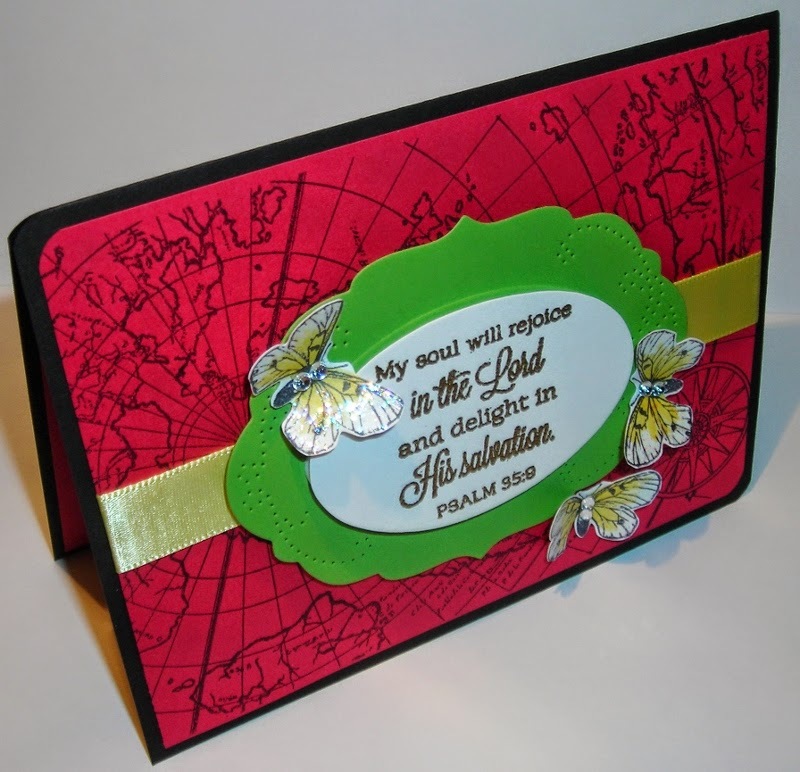 "My soul will rejoice in the Lord & delight in His Salvation." The gold & yellow symbolize Heaven. Rev. 5:11; 21; 22; John 14:2; Acts 1:8-11. Heaven, our reward for obeying God & repenting of our sins & accepting Jesus Christ as Lord & Savior. I also added the butterflies from Flourishes- Old Tea Rose, to symbolize "New Life"-this is what Christ gives us in return for making Him Lord of our lives. The rhinestones symbolize the crowns we will receive for being faithful followers of Christ; that we will lay at Jesus feet for what He did for us on the cross. Also, James 1:12, Rev. 2: 10 & 1 Peter 5:4. I tried to make the butterflies wings sparkly with stickles, because that is what we, as His children will be when we reach heaven shinning & beautiful, "holy" before our Lord. That is how God will see us! Because we will be like HIM! "Yet now He has reconciled you to Himself through the death of Christ in His physical body. As a result, He has brought you into His own presence, & you are holy & blameless as you stand before Him without a single fault." The yellow on the butterflies symbolizes the reflection of the shinning streets of gold we will walk on! 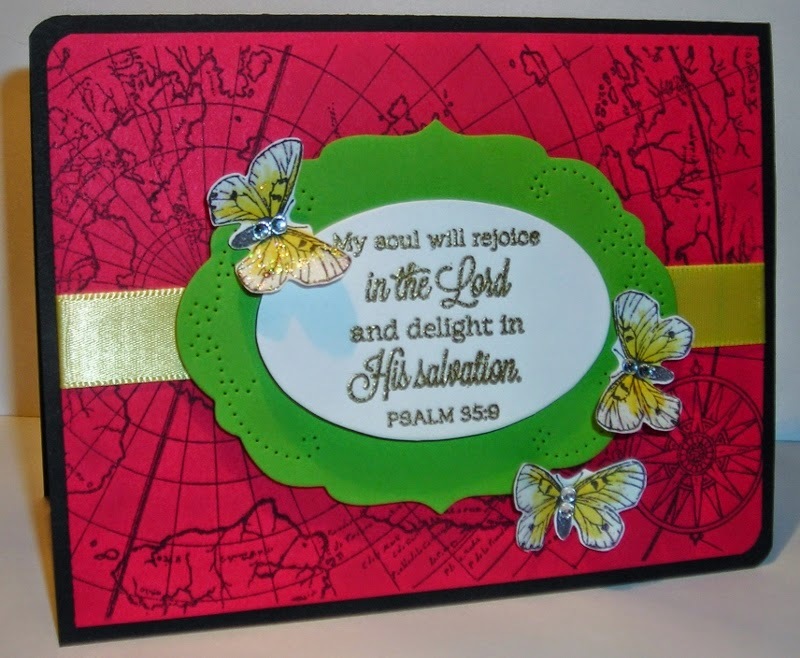 The inside is fairly simple done with just a little masking; The butterflies- symbolizing His children, those who have accepted Christ; washed in the Blood of the Lamb, Christ! And lots of space for someone to "Speak Life" to someone who needs it! "Speak Life" today to someone! 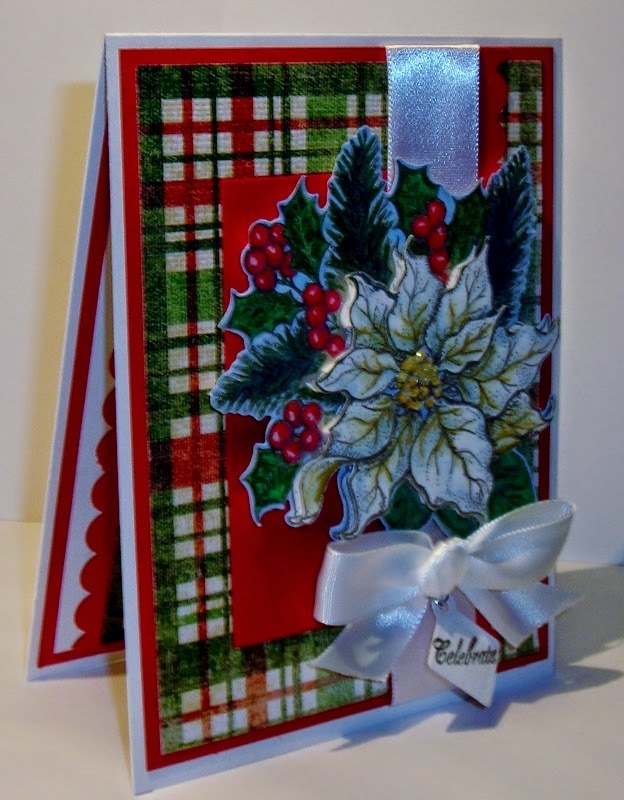 A Flourishes "Christmas in July!" 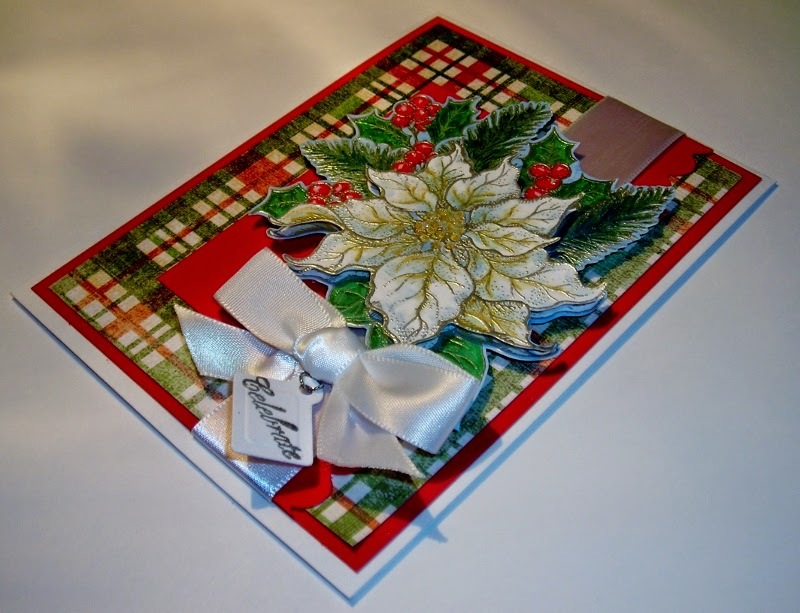 than with a Flourishes Christmas Image! I just gravitate to them. I can come up with a thousand different reasons to buy them in bulk like that! So, I guess it is natural, I would have a good collection of Christmas Stamps. 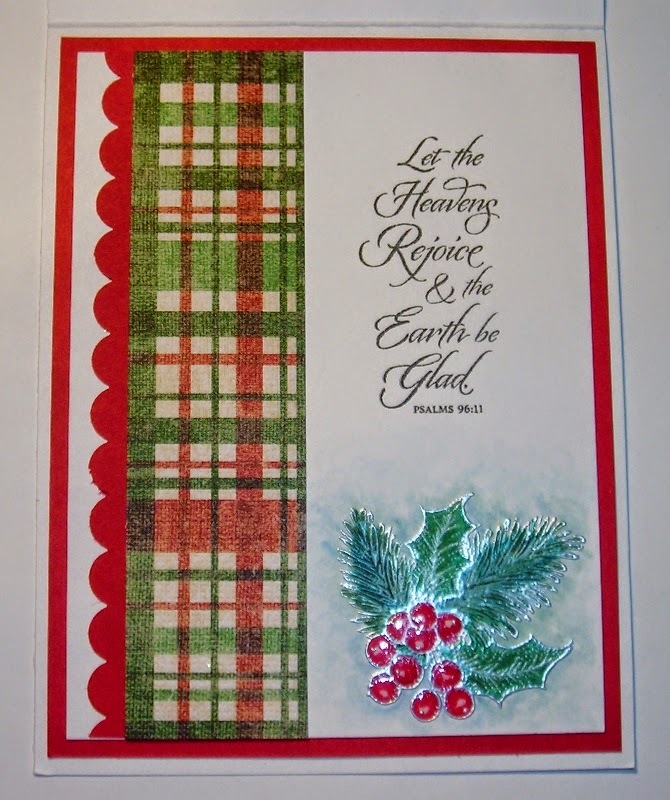 But, I should tell you there are more Flourishes Christmas stamps that I long to have! Someone will be there to help you meet that longing! 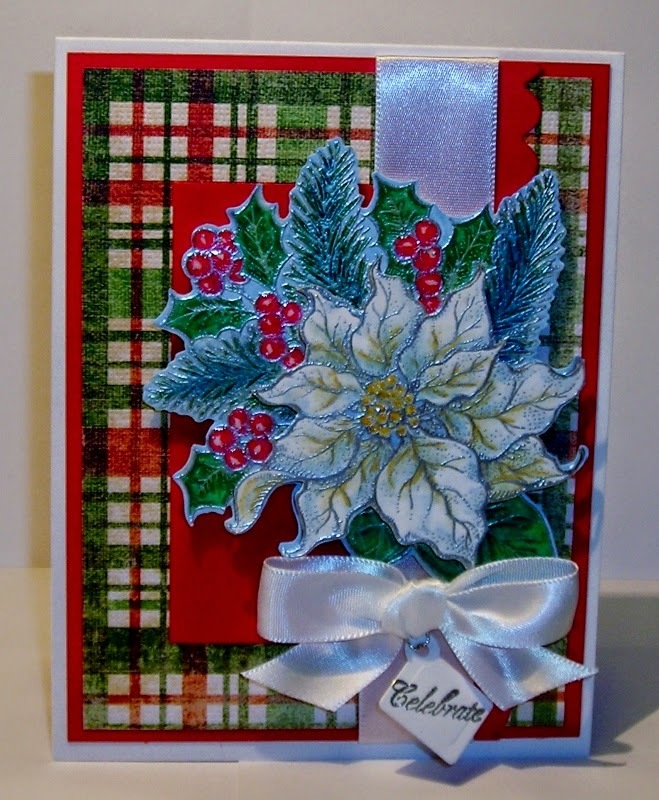 I used Flourishes- Poinsettia & Pine. 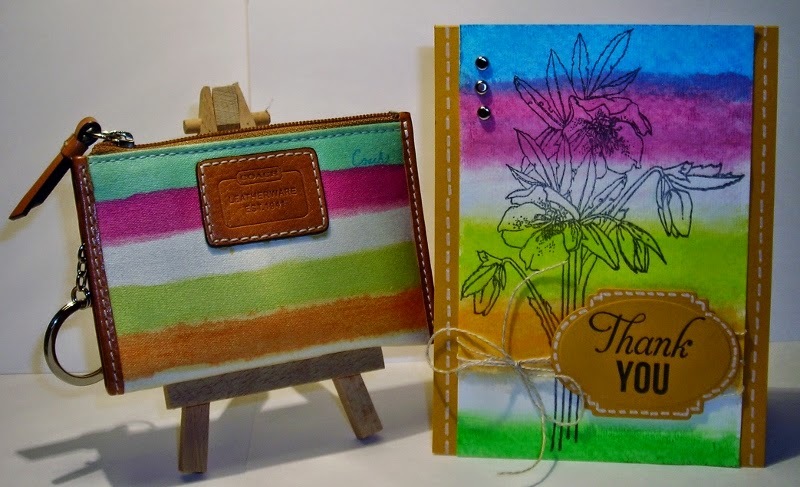 I stamped the image with Versa Mark & heat embossed it with Silver Embossing Powder- SU. one is only the flower though, & popped it up on dimensionals. 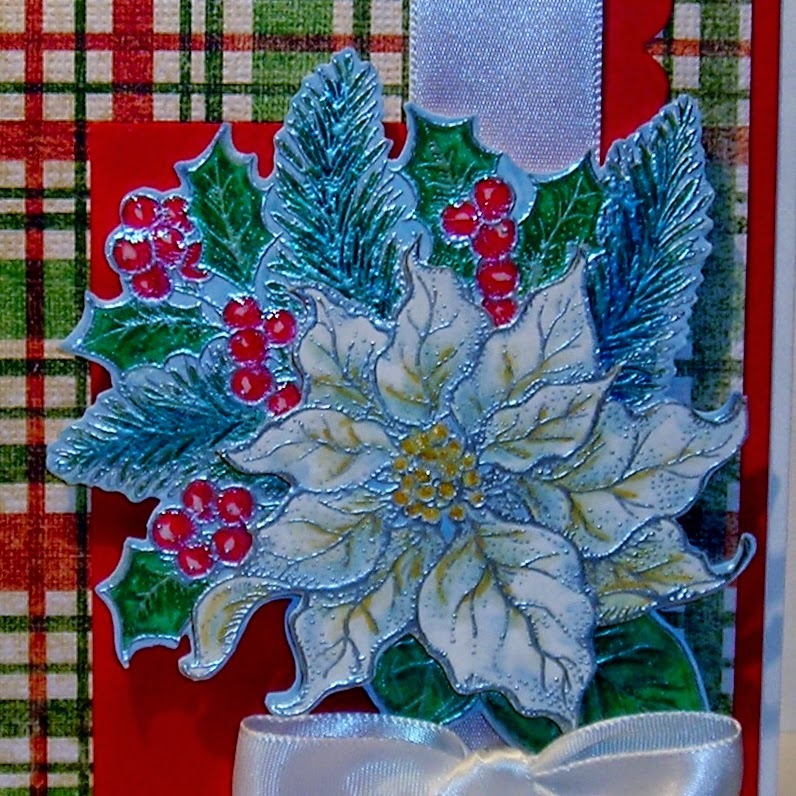 I also added Diamond Glaze to the berries & MS- Crystal Fine Glitter to the center of the poinsettia. If you look really look closely at the inspiration picture, you can see blue. I incorporated blue into my image with adding blue to the pine needles & the poinsettia itself. 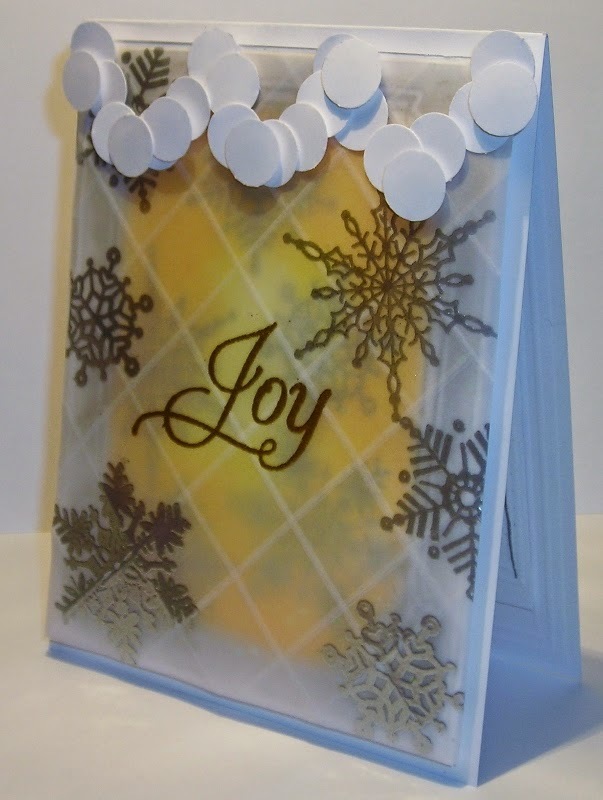 & the little tag is Flourishes- Classic Tags Template Dies. The sentiment is from Flourishes- Seasonal Wreaths. So what do you think? Should we have Christmas in July? 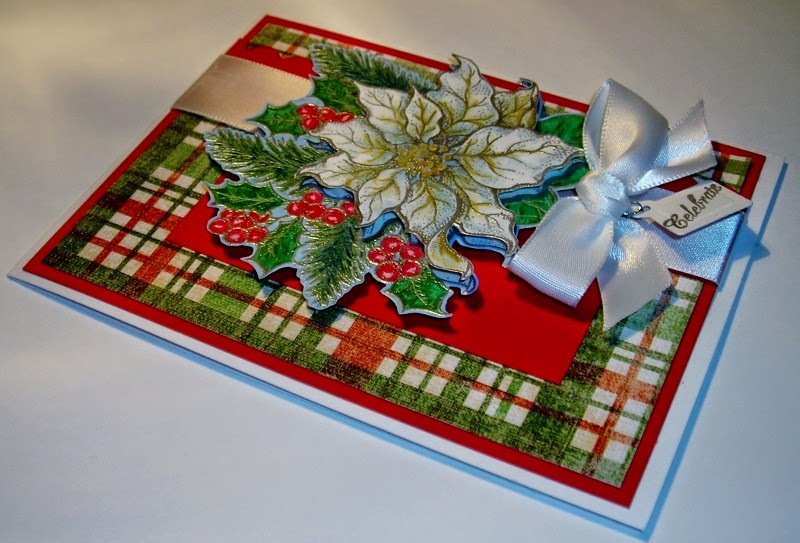 but I sure do enjoy making Christmas cards any time of the year! thank you to those that take the time to leave me some love! A Good Ole Fashioned Independence Day! The U.S.A is a unique country in that we are a free people! After Salvation through Christ, there is nothing so precious as Freedom! Many people in the United States choose to celebrate this special day with their families. Having cook-outs/picnics, hamburgers/hot dogs, potato salad, apple pies & watermelon, parades, waving our flag, & fireworks.... The list of activities can go on & on! We have MUCH to celebrate in being free! "A Good Ole Fashioned Independence Day!" 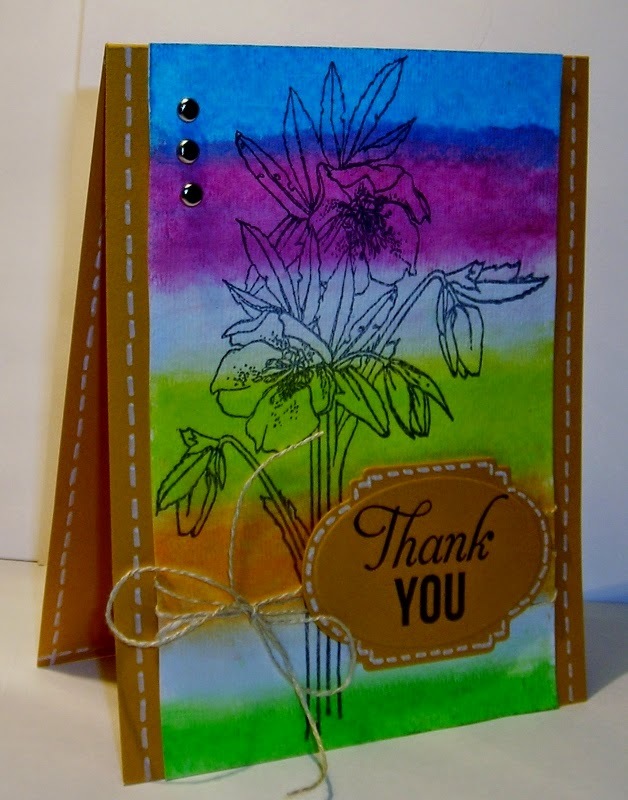 Flourishes is always happy to help you with your stamping needs! Of course, I had to use a plaid paper for the plaid table clothes on our picnic tables! 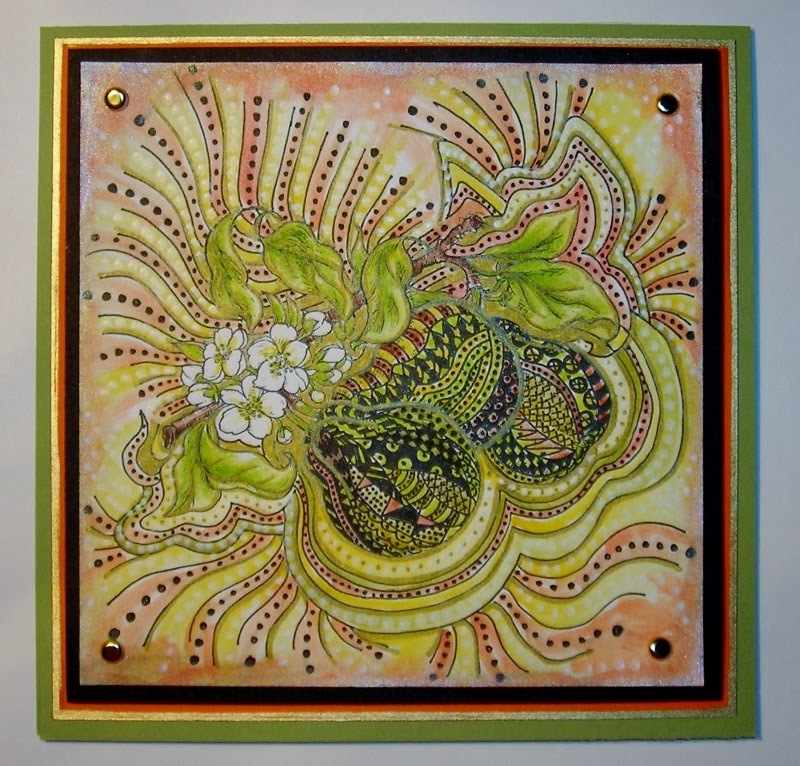 along with Flourishes- Season of Wreaths for my sentiment. Here is a close-up of my image. & Flourishes- Garden Picks for the Ball Jar. Blue Ball Jars were brought back for our Bicentennial Celebration! I love the blue jars! I masked the jar & sponged the sky & the "picnic table" I'd drawn in. I also used a ruler & pencil to draw lines for placement, for the pin-wheel sticks. & erasing the pencil marks with my knead eraser. (Knead Erasers are fun to play with...kind of like "Silly Putty,"
I used a Prisma Color Marker to color my Ball Jar. going from the side to the center of the jar. For the short "neck" of the jar, I stroked the pen downward. I finished off the jar by adding Diamond Glaze. so they would cooperate & be rounded rather than flat. I added the centers with Perfect Pearls. 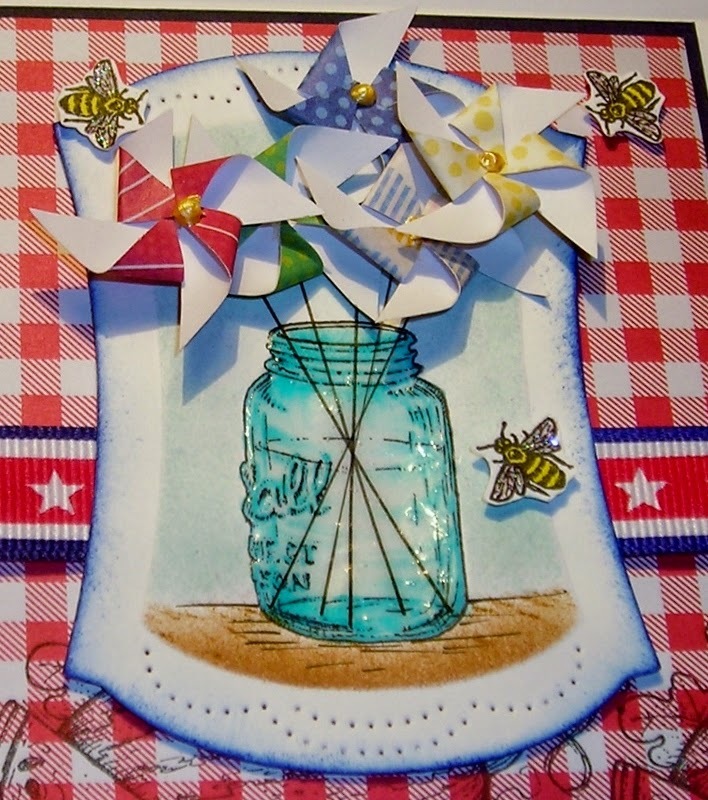 The little bees are from Flourishes- Tiny Flowers & Tags. I raised most everything up on dimensionals, the navy base, the die, the bees, & the pinwheels! Some of the pinwheels are triple-layered with dimensionals to make them stand up over the others. Hope you are inspired & I hope you have a wonderful "Independence Day" with your families! Your comments are very welcome & much appreciated.